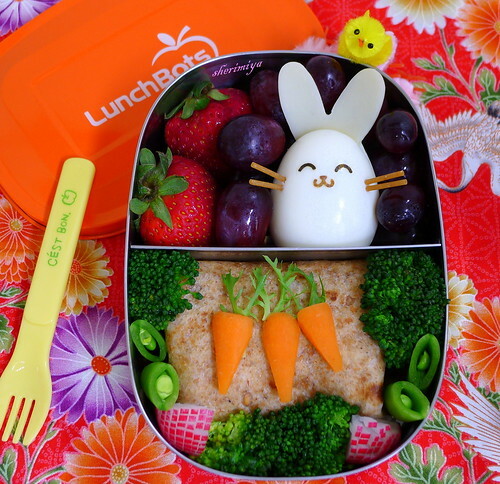 Easter Bunny Chicken Burrito Bento, a photo by sherimiya ♥ on Flickr. More bunnies, and more! This one is made from a hen egg, with cheese ears, nori face and spaghetti whiskers. He is smiling because he's got a garden of carrots waiting for him at lunch. 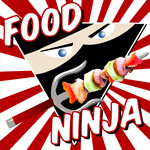 They lie atop a pulled barbeque chicken burrito wrapped in a whole wheat tortilla, surrounded by broccoli, peapods, and radishes. The sweet side contains strawberries and grapes. There's that little chick again, trying to get into the bento. Sorry lil' guy! you have a very white cheese. Sheri..
was it a goat cheese? Thanks Yenny; I use Swiss cheese. It's firm and holds up to cutting well. That is SO cute! Call me crazy but I think I love those mini carrots the most. lol!